01. A system is grayed out in the Computers section of the Navigation Tree. Which basic check should be performed? a) Look at the Relay for the grayed out system and determine if the Relay Service is running. b) Determine if the system is a laptop. Laptop systems often connect to and disconnect from the network and when disconnected, it will be grayed out. c) Attempt to ping the system from a workstation. If it is not reachable, it means the system is most likely turned off and is in a normal state at this time. d) Attempt to ping the system from the IBM Tivoli Endpoint Manager Server. If it is not reachable, it means the system is most likely turned off and is in a normal state at this time. 02. Which statement is true about Relay Affiliation group names? a) The names are case sensitive. b) Names must start with a double underscore. c) Names must not use a relay machine name. d) Any naming scheme can be set up by an administrator. 03. What makes a system a good candidate to be an IBM Tivoli Endpoint Manager (TEM) Relay? a) It should always be a system dedicated to the relay. b) An existing system that meets the requirements of the TEM Relay. c) It should run Windows Server 2003, Windows Server 2008, or Mac OS X Server. d) It should have dual network interfaces to isolate agents from downstream relays. 04. In which language can the Retrieved Properties be written that underlies each analyses? 05. Why would an IBM Tivoli Endpoint Manager (TEM) administrator use the task relay setting Name Override? 06. Which two types of operators can log into the IBM Tivoli Endpoint Manager Console? 07. Which computer groups are available in an IBM Tivoli Endpoint Manager V8.1 environment? 08. How should operating system and application patches be tested? 09. What are three requirements for an endpoint to be used as a relay? 10. What is an IBM Tivoli Endpoint Manager analysis? a) It allows viewing of various client properties. b) It allows changing of various client properties. c) It is a task used to analyze the status of the clients. d) It is a Fixlet used to analyze the status of the clients. 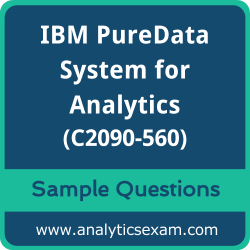 Note: Please write us on feedback@analyticsexam.com if you find any data entry error in these IBM PureData System for Analytics v7.1 (C2090-560) sample questions.